“This could have been a lot worse. It could have been a horrible, horrible massacre – so much worse,” the official said. After firing from his vehicle at a military recruiting office, Abdulazeez crashed through the gate at the Navy training center, exited from his car, and opened fire as he approached the building. “The shooter made entry into the building, proceeded to move through the building, pursuing the sailors and Marines who were attempting to evade him,” said FBI Special Agent Edward W. Reinhold, speaking on the record. According to Reinhold’s account, Abdulazeez shot the first person he encountered in the building, passed through the structure without claiming any other victims, then came out the back door into the fenced-in motor pool area. Four of the five military victims were killed in this area. “Two service members attempted to provide cover and assist the military personnel attempting to get over the fence,” said Reinhold. The police arrived and confronted Abdulazeez in the motor pool area, with “hundreds of rounds fired” during the exchange. Although forensics on the complicated gun battle are still in progress, law enforcement officials were confident none of the Marines or slain Navy Petty Officer Randall Smith were hit by friendly fire. “Our Marines reacted the way you would expect, rapidly going room to room, getting people to safety. After they had gotten to safety, some willingly ran back into the fight. 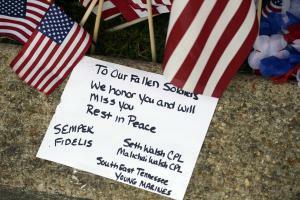 All of us can be extremely proud of what our Marines did that day,” said Marine Major General Paul W. Brier.